I'd have to see more to know whether I can use it or not but I do have to say, I LOVE THE COLORS! I think I'm in love!! This just says Alphonse Mucha and Art Nouveau to me. I've got chills. Not sure yet if this is my cup of tea or not. Would be interested to see more. *Squeal! 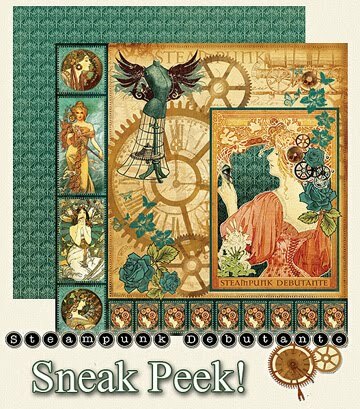 * LOVE Graphic 45 and LOVE Steampunk! Can't wait for this release! I'm a Steampunk Junkie, I would so LOve this!!!! ew. kinda creepy at first glance.